NU Sentral is the first Malaysia’s integrated lifestyle and retail hub which optimize the changing lifestyles of Malaysian and international travellers. Nu Sentral Shopping Centre promise to combine lifestyle shopping with convenience that appeals to discerning modern and urban consumers. It combines connectivity, convenience and convergence to cater to the ever-changing needs of retailers and consumers, with a captive market of over 800,000 households and a total population of over 3.6 million. 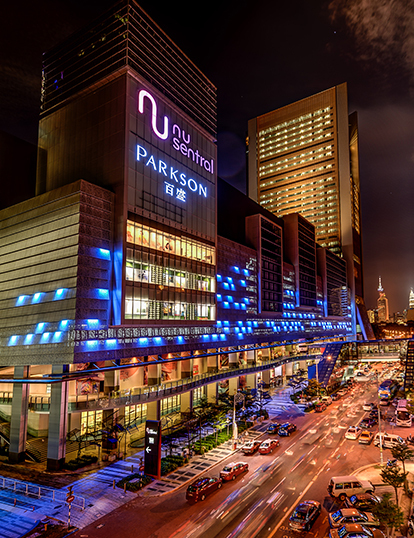 The NU Heart of Kuala Lumpur (KL), NU Sentral connects our whole city, enhancing every facet of our lives. For the first time we have our own integrated lifestyle NU Sentral that is connected to the nations’s transit hub. NU Sentral connects seamlessly with Stesen Sentral Kuala Lumpur, which provides connectivity to the entire Kuala Lumpur city - to cities all across Malaysia - to Singapore - to Thailand - and many other internaltional destinations.Trains, planed, busses, expressways! NU Sentral’s inspired location offers previously unheard of convenience and a whole new world of connectivity for over 160,000 visitors daily.